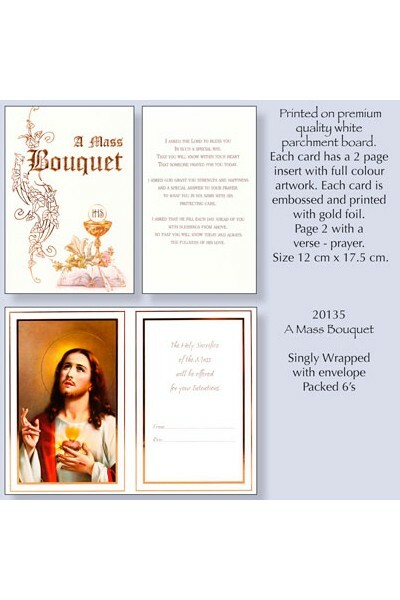 A Mass Bouquet card printed on premium quality white parchment board. Each card has a 2 page insert with full colour artwork. The card is embossed and printed with gold foil. Page 2 with a verse prayer. inside text: I ASKED THE LORD TO BLESS YOU IN SUCH A SPECIAL WAY. THAT YOU WILL KNOW WITHIN YOUR HEART THAT SOMEONE PRAYED FOR YOU TODAY. I ASKED GOD TO GRANT YOU STRENGTH AND HAPPINESS AND A SPECIAL ANSWER TO YOUR PRAYER. TO WRAP YOU IN HIS ARMS WITH HIS PROTECTING CARE. I ASKED THAT HE FILL EACH DAY AHEAD OF YOU WITH BLESSINGS FROM ABOVE. SO THAT YOU WILL KNOW TODAY AND ALWAYS THE FULLNESS OF HIS LOVE. Product specification. size 17.5 x 12cm.